Blooming Where Planted: Happy St. Patrick's Day! 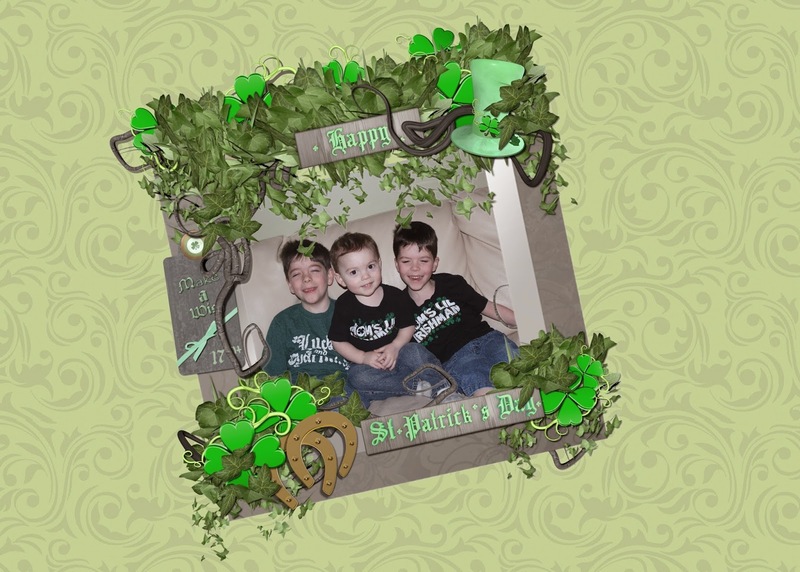 Did you have a Happy St. Patrick's Day? We sure did! We started off the day right with Daddy's homemade green biscuits and gravy. And the boys rustled us some St. Patrick's T-shirts, and were kind enough to pose for me before they headed off to school. I was borrowing Piper for the week, this is her last week, so I decided we would do some special St. Patrick's Day things. First, we had to start the day with our manditory viewing of the Veggie Tales story of St. Patrick. These were my little lovebugs ready for an afternoon of people watching! We scoped out a spot at the corner of Meridian and Vermont, just at the end of the Parade route. It was Perfect! I have lived in this town most of my life, and never gone downtown for the St. Patrick's Day parade before. It was Great! It was like the feel of being in Brownsburg for one of our hometown parades, but still being in the 'big city'. It was Fabulous! The first group that came around was the IPD motorcycle brigade, that waved flags, and literally spelled the word Indiana, and made fabulous shapes as they wove around the street. Amazing. And I was so Thankful that I had the kids locked down in the stroller. That motorcycle was perilously close. Too close for my taste, but that was part of the trick, they had mad skillz. The kids had so much watching all the floats go by. And I enjoyed them too. There were easily a dozen different bands of sorts. I loved that. Did not love when a kid from Shortridge gave the finger in our general direction. Trashy. Luckily, my yahoos are too young for that. Kathleen caught up with us, and we got to watch the parade together for a bit. We got the much needed Irish Godmother picture, It's becoming a Thing. Then we got to see Emily walking with her Irish Dance troupe. They weren't dancing as they walked by us, but about 50 paces later they stopped and danced. Luckily, she was wearing a hard-to-miss red sweatshirt, so it was easy to spot her bouncing curls. But that's all we really saw. She did see us, smiled and waved at the kids. :) So that made it worthwhile. And who doesn't love the Oscar Meyer Weinermobile. I must confess Sam wasn't sad he missed the parade, he was sad he missed seeing this car in person. Maybe next year I'll take them with me. It's good for kids to get some 'culture'. They don't need school All the Time, do they?! For me, this pic sums it all up: an Irish flag, marching band with bagpipes, and a giant man dressed as a bottle of Guiness. This is My Town! I loved this parade, I don't know why it's taken me 39 years to get down here. I loved it, and can't wait to go back again!